death star trash compactor | WorstPlans.com updates every Monday! Shield your mind from the horrors found in a shared breakroom fridge with a futuristic conveyor-belt-based refrigerator! What has been seen cannot be unseen. Have you ever had to deal with a shared refrigerator? If so, you may be familiar with the issue of old food items piling up in nooks and crannies of the fridge and never being removed. Periodically cleaning the fridge will fix this, but it’s a hassle to figure out which food is old and which is new, especially when opaque containers are involved. Fig. 1: Philosophers theorize that rotting food should ideally go into the trash, rather than the shared fridge. So how can we AUTOMATICALLY clean out a fridge without any effort? The old-fashioned solution is to have people label food with a date (e.g. “Oct 14 leftovers”). But unless every single item is clearly labeled, we have only slightly reduced the fridge-cleaning problem. Fig. 2: A fridge with three shelves (from top to bottom: orange, purple, blue). We can use a conveyor-belt-like system to automatically clear old items out of the fridge. The way it works is quite simple: each shelf is attached to a track, which can move the shelves up and down. Every day (or other interval of time), the shelves move up one shelf-height, and all the food on the top shelf is thrown into the trash. That top shelf now becomes the bottom shelf, and the cycle continues. Fig. 3: A) The default state of the fridge; casual examination reveals nothing unusual about this setup. However, the orange (top) shelf is about to be automatically cleared of rotten food and expired leftovers. B) First, the top of the fridge pivots open (#1), then all the shelves travel along a track (not shown) that elevates them by one shelf-height. The orange shelf is now outside of the fridge entirely. C) In step #3, the orange “to be cleared of trash” shelf is pivoted up and shaken violently, causing the old food items (#4) to fall into the trash can. D) In step #5, the top of the fridge closes, and the now-clear-of-trash shelf (#6, in orange) is placed on the top of the fridge. Someone will have to manually put this shelf back into the fridge (where it will become the new bottom shelf). The purple shelf is the next to-be-trashed shelf. If each shelf moves up one shelf-sized slot per week, and there are three shelves, then it means that the food on the very bottom shelf would be safe for 3 weeks before being automatically trashed. Therefore, as long as a motivated fridge-using individual can be bothered to check in on their food at least a couple of times a month, it will be preserved. But any food item that isn’t shepherded to a lower shelf at least once during the course of the food-deletion period will be mercilessly thrown away. PROS: Prevents strife from blaming your coworkers for throwing out your “no you guys, it’s totally still fine!” two-week-old leftovers. CONS: May be slightly on the Rube-Goldberg-esque side of mechanical over-complication. Supplementary Fig. A: Original concept for the conveyor-belt-auto-trash fridge. Regain hours of your life every day with this one weird anti-procrastination tip that may involve horrifying injury! You’ll never believe what happened next. However, until now, there has been no way to properly represent a person’s currently unresolved obligations in a three-dimensional space. This metal plate is attached to a telescoping arm that can push the plate away from the wall and into the main space of the room. In this fashion, the metal plate can take up as much of the room as needed, partitioning it into a “still usable” space and a “hidden behind the crushing wall” space. The crushing wall would be linked the user’s email and calendar programs. If the user has many un-resolved email messages from days ago, and a large number of outstanding obligations (for example, “do taxes” or “repaint living room”), the wall will extend to take up a large amount of space in the room. When the user resolves these tasks, the wall will retract back towards its origin. For example, if the user only has a few minor tasks to do (e.g. “go shopping for bread”), the wall will retract so that it only takes up a few inches along the wall. Fig 1: In this figure, the crushing wall is mounted on the left wall. The remaining usable space in the room (right side) has only a table and door in it. Judging from the position of this wall, the user has a large number of currently outstanding tasks that they need to resolve if they want the crushing wall to retract. Fig 2: Side view of a room similar to the one above. Blue area (left): a heavy-duty mounting bracket to attach the crushing wall to the floor and ceiling. Green: a telescoping hydraulic arm to allow the wall to move. Yellow: the crushing wall. 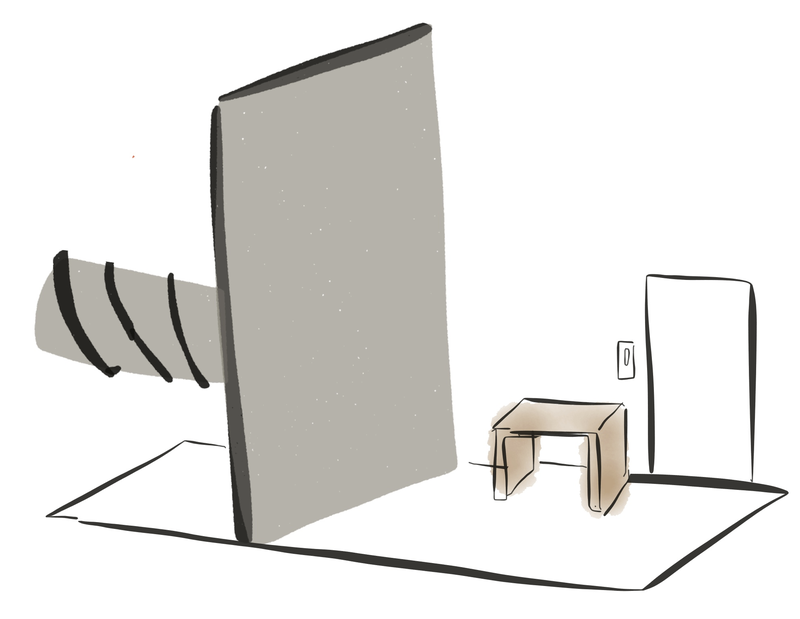 In this diagram, the wall is taking up approximately two-thirds of the room. This new room furnishing will make it easy for a person to visualize how many un-resolved tasks they need to work on, and will provide a satisfying sense of accomplishment when a task is complete and the wall retracts a few inches. PROS: Provides sense of accomplishment. Reinvents the classic to-do list in three-dimensional form.